There are some wonderful paintings with equestrian themes coming up for auction at John Moran’s in Pasedena (but you don’t need to be there to bid) on April 17th. 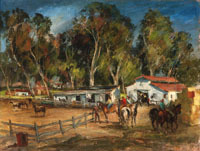 As a riding instructor, I’m in love with the oil on canvas by Emil J. Kosa Jr. (1903-1968) entitled Griffith Park in Los Angeles. Although I didn’t grow up on the West Coast, I did ride in barns just like this on the East Coast, back in the day — the day when the automatic release was popular. Oh, nostalgia! The 22″ x 30″ painting has been signed and numbered on the stretchers. The auction house estimates it will go for between $4,000 and $6,000. 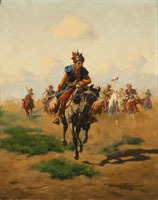 Maybe this is more your speed…Nicholas S. Firfires’ 24″ x 40″ oil on canvas entitled The Round-Up, signed and dated 1962. If you bid and win it (the estimate is $2000 to $3000), you’ll also get the book Nicholas S. Firfires: Views from His Saddle, from the Santa Barbara Historical Museum in California. The 9″ x 12″ work by Lloyd Harting entitled Stagecoach in the Snow is a watercolor heightened with white gouache on paperboard. Although it’s described as in “generally good condition with some minor scattered spots of stain throughout,” it’s signed by the Orange County, CA artist (1901-1974) and the estimate is most affordable at $800-$1200. It’s a wonderful image and you can feel the horses pulling the stagecoach when you look at it. Another Santa Barbara artist — Edward Borein (1872-1945) is well represented, with four small and nicely framed works up for bidding — a watercolor and three etchings and drypoint on paper. The wildest etching, without a doubt, has the equally wild title Robes & Meat. It measures 6″ x 9.5″ and the estimate is $1000 to $2000. You’ll want to look at the online catalog for full details. There are also some wonderful landscapes. Who knew Laguna Beach once looked the way it looks in some of these paintings? Moran’s also has some great paintings featuring horses in the European & Modern Fine Art Auction also taking place on April 17th. Do you think the set designer for Spielberg’s War Horse saw this painting before working on the film? It’s a signed oil on panel laid to a modern panel, 18″ x 24″, with an estimate of $1500-$2000. The painting shows some signs of age, but then, the British artist lived from 1792-1882. Less reasonably priced, but no less exotic is Frederic Arthur Bridgman’s 1882 oil on canvas, the 34″ x 53.5″ Street Scene Algiers, with an estimate of $300,000 to $500,000. Unfortunately, my walls are full. My favorite’s are the Herring’s Hunt scenes and the Wallace Nuttings. There is one Nutting in the den which is called ” A Merry Drive”. It shows a lovely spring scene: a winding dirt lane, cherry blossoms in bloom, and a neat little pile of horse poop in the middle of the road amongst the hoof prints. Hmm, considering my favorite is the most expensive one you’ve listed I’m pretty sure I won’t be spending any money at this auction. Darn my middle class income! Well, it’s comforting to know you have good taste (leaving aside any discussion of boots, lol), isn’t it? All my money goes to saddles (! ), but I was hoping some of my readers might be interested in these works.